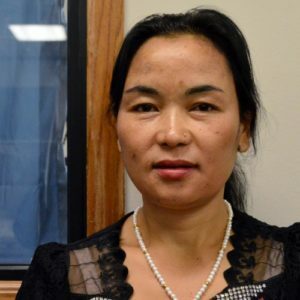 Her family moved to a refugee camp in Nepal and lived there for 18 years; it wasn’t until September 2012 that she arrived in the United States. She and her daughter currently live in Salt Lake City where Thuli works as a housekeeper at a hotel. Thuli explained how everything is different in the US than what she’s used to. For the first time in a long time, she felt safe walking by herself and being independent. It wasn’t until she arrived in Utah that she was able to fulfill a lifelong goal – to go to school. “When I was young, I was so desperate to go to school, but my father forbid it. One day I snuck out and tried to go to school with my friends, but my father found out and dragged me back home. It’s something I always regretted, was not being able to go to school.” Thuli is currently enrolled in English classes and is thrilled that her daughter is now able to attend school as well. Thuli is still very involved with RIC-AAU. She claims that she is successful today because of the aid she received from the agency. She frequently requests help with paperwork, and translation. She has also become self-sufficient enough to learn public transportation and even save up enough to purchase a car. In the first few months of arrival, Thuli struggled adapting successfully. She recalled getting lost in Salt Lake after trying to get to an appointment. She was stranded in South Salt Lake for hours, walking around hoping to find someone who spoke her language. It wasn’t until after she started her current job that she felt that she had found her niche. Her coworkers also speak Nepali, and she has been able to join her cultural community because of her newfound connections. She has since embraced her new life in Utah and is happy to call the US home.